From a delicious slice of panettone to beautifully made Nativity Scenes set up in churches, schools and squares, there are many things that are part of Italy’s traditional Christmas experience. Yet, year after year, a relatively new event is leaving an increasingly deeper imprint on the Christmas festivities in the bel paese. And it’s thus modernising the celebration of one of Christianity’s biggest festivals. 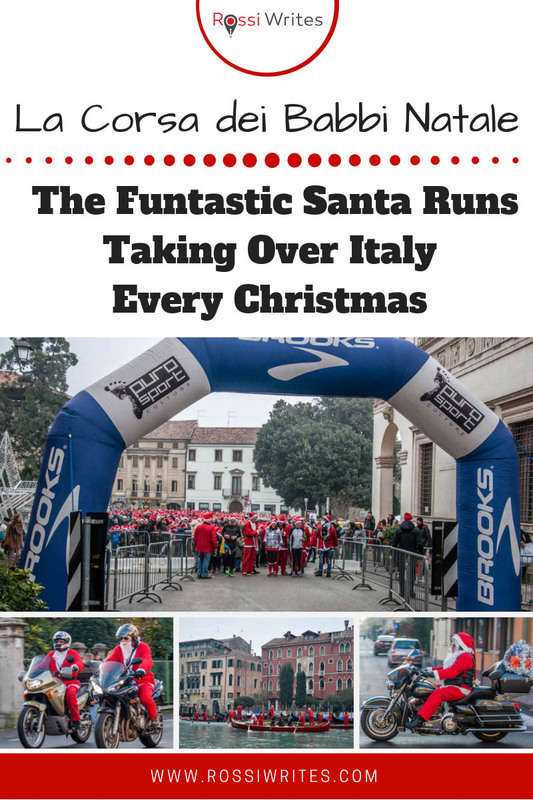 I am talking about the fun Santa Runs or, as they are called here in Italy – La Corsa dei Babbi Natale! But what is a Santa Run?! A Santa Run (also often referred to as Santa Dash in English) is a non-competitive run of anything from 3 km to 12 km. It could be a charity fundraising event or a commercial one. 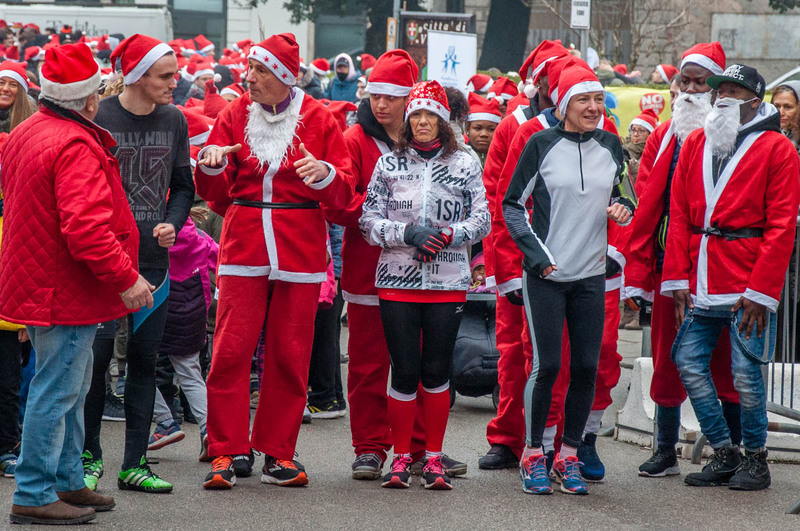 The runners pay an entry fee to the organisers and in exchange, they receive a Santa outfit (often coupled with a fake beard) which they wear during the run. This creates a rather fun and pleasing effect of hundreds of Santas running along central city streets following a pre-determined route. As you can imagine, that’s a lot of red and white blur. In the month of December, Santa Runs take place in cities all over the world. The runs have been growing in popularity in the last 15 years or so. Every year more and more cities and people join in the fun. In order to attract bigger crowds, nowadays, Santa Runs are also promoted as Santa Walks so that people of all abilities can join in. Well, in Italy Santa Runs are now all the rage. This December thousands of Babbi Natale ran in, seemingly, every large and not-so-large Italian city and town bringing Christmas cheer to the crowds of onlookers. 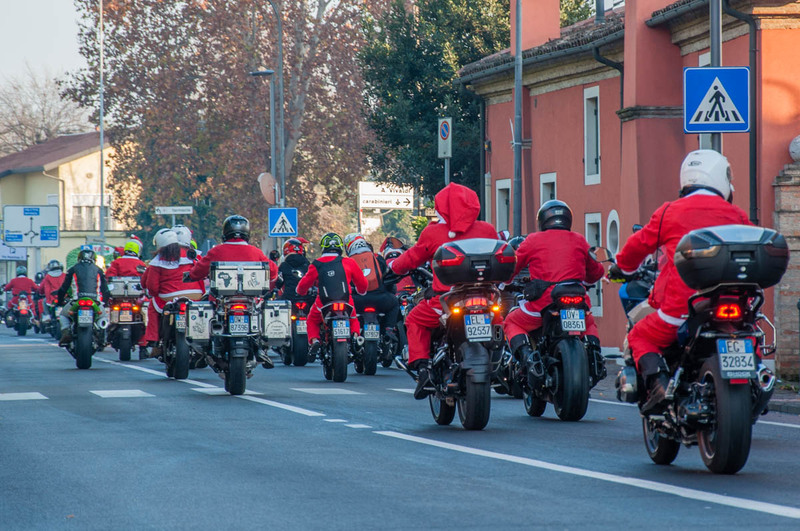 The Santa Run events usually take place on weekends, yet the one in Vicenza was held only this past Friday. 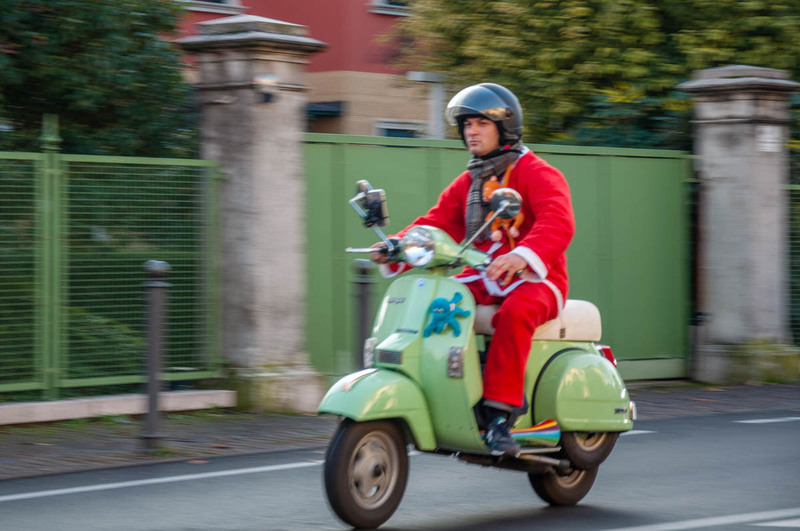 With Christmas being literally a day away, here is a nice selection of photos from three distinctive Santa Runs which take place in the Northern Italian region of the Veneto every December. I have had the pleasure of seeing them first-hand over the four years that I have spent living here in Vicenza. 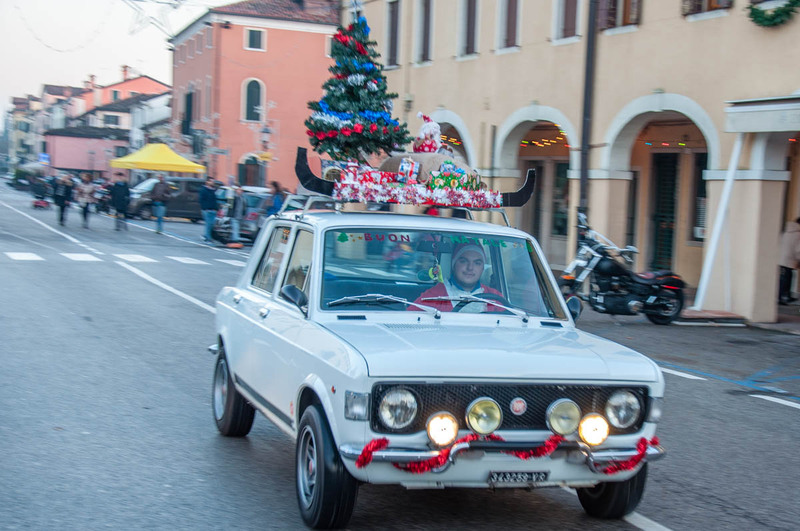 A classic Santa Run happens in Vicenza every December. Hundreds of people dressed as Babbo Natale (that’s Father Christmas in Italian) take to the streets of the city’s historical centre. They run along a pre-determined route. At the end of the run, all Babbi Natale receive a festive slice of panettone and a cup of hot chocolate. 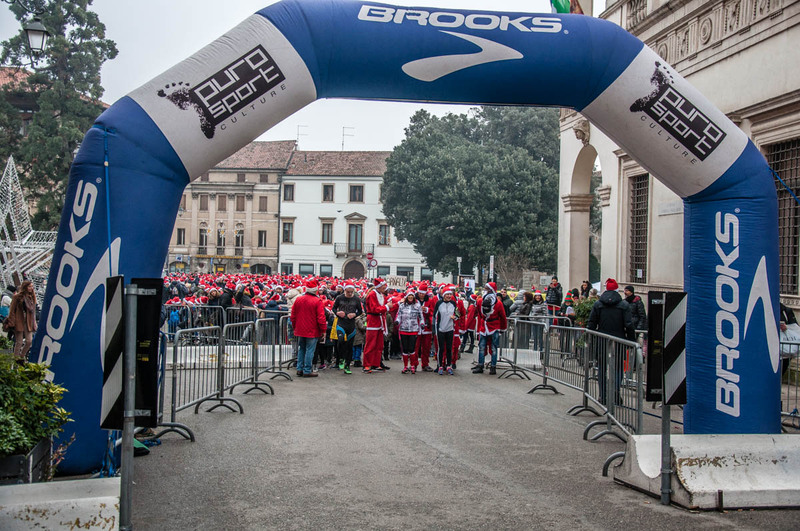 This year, hundreds of students from the local schools took part in the Santa Run in Vicenza. 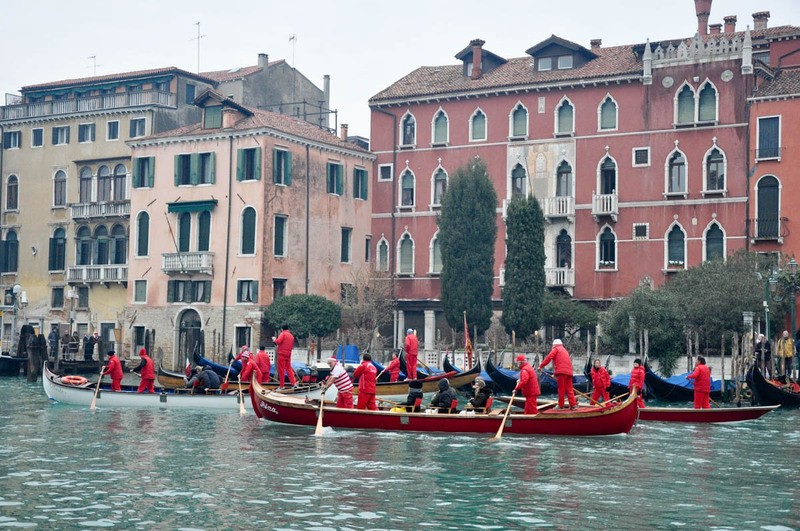 Venice – the city of water – organises a yearly Regatta of the Santas. It sounds wacky but seeing dozens of boats rowed on the Grand Canal by men and women dressed as Santa is a sight to behold. 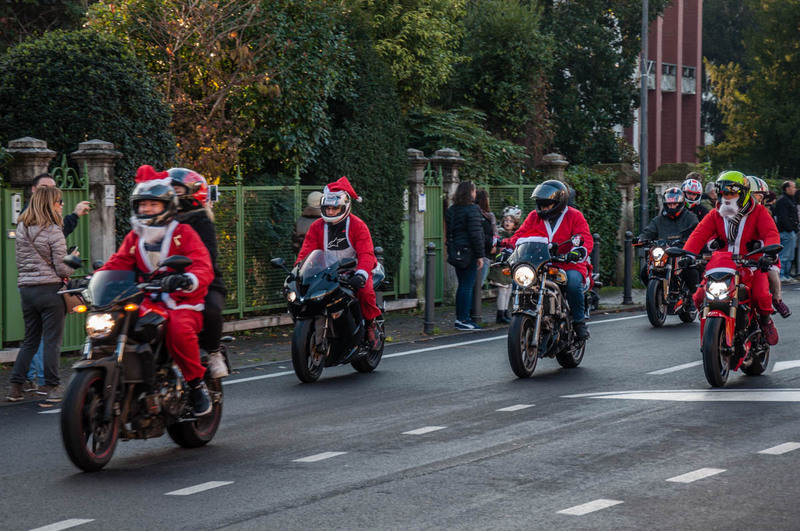 A Santa event with a difference, MotoBabbo attracts over half a thousand bikers disguised as Father Christmas. 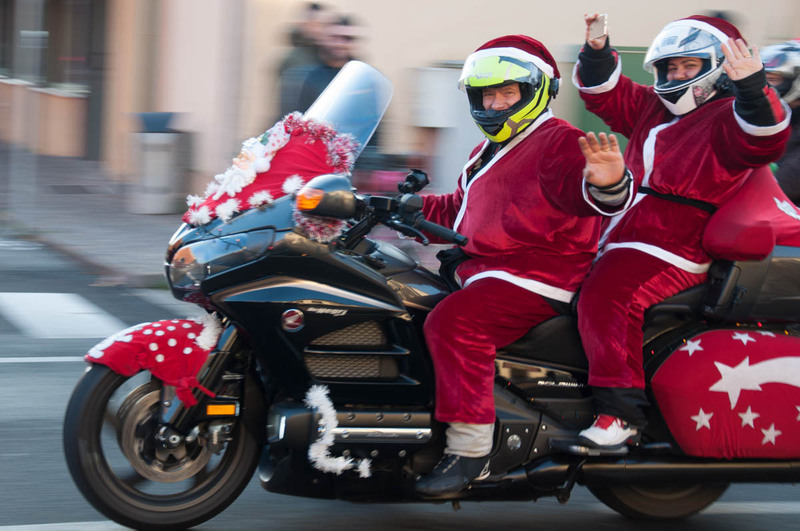 Dressed in red and white and adorned with tinsel, reindeer antlers and, in some cases, whole Christmas trees, the bikers go for a ride starting from the picturesque town of Mirano. 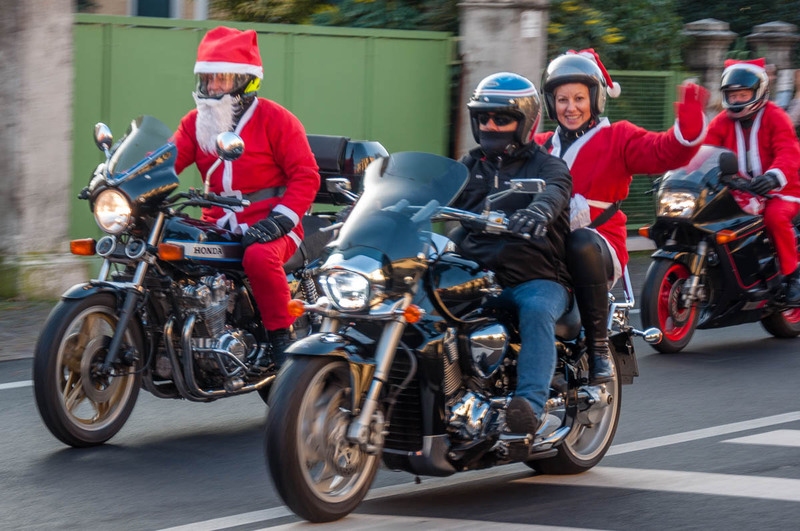 Seeing the hundreds of bikes woosh past – each carrying at least one Santa – is a once-in-a-lifetime experience. Click here to see a video of MotoBabbo 2018. Have you taken part in a Santa Run in Italy or anywhere in the world? Was it fun? Also, which one of the above three Italian Santa Runs would you like to experience for yourself? Let me know in the comments below. Thank you for reading! Please, leave me a comment, pin the image below or use the buttons right at the top and at the end of this blog post to share it on social media. For more useful information like this, you can like my blog’s page on Facebook and subscribe to my weekly strictly no-spam newsletter.